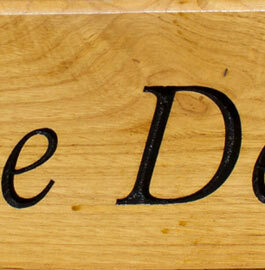 Wooden house signs made from Chestnut - Good value wooden signs. 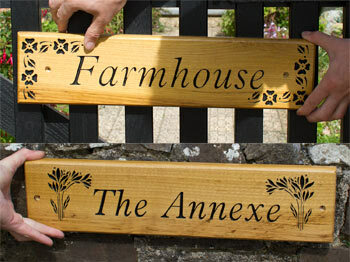 The timber for these wooden house signs is all grown in the South West and sourced from a local timber yard. Chestnut is a sustainable timber often grown in coppiced woodlands. Sweet chestnut is traditionally known as poor mans oak! However we don't look at it this way - more of an interesting alternative to oak. It certainly does look very similar to oak with a fairly dense grain. It also has a high tannin content that makes it very durable. Chestnut may not be as structurally strong as oak but for wooden house signs that does not matter in the slightest. It can be left untreated and in most circumstances will weather down to a silver grey colour. Alternatively we can stop the weathering with one of our wood treatments. The price includes 6 letters - extra letters are £1.10 per letter. Lots of different fonts to choose from. Letter colour can be black, brown, green, bright blue or navy blue. 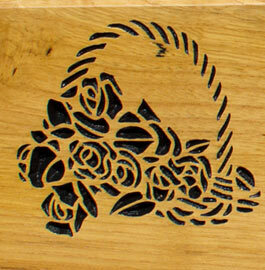 You can also choose one of our standard images @ £7.50 A line border can be included @ £ 5.95. It can have square or indented corners. Holes can be drilled if required @ 85p per hole. We do have a range of fittings, wooden posts and hanging brackets. Made in the UK. Our team at The Sign Maker looks forward to helping you with your painted wooden house sign.